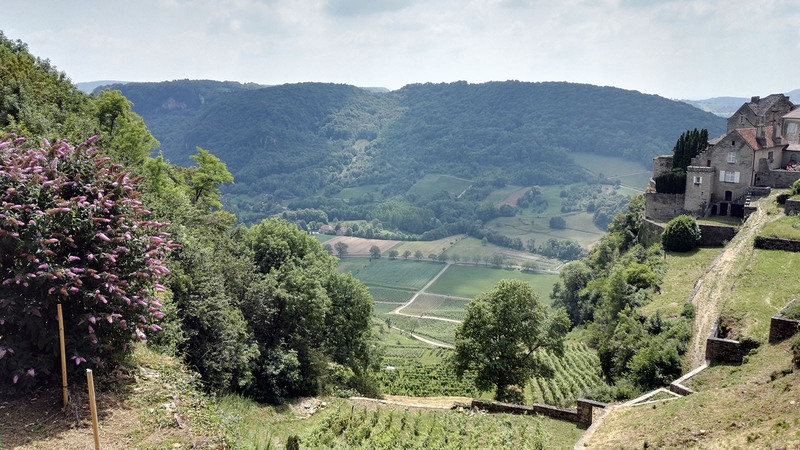 Vineyards in the Jura. July 2016. It is no secret that the French Jura is one of my favourite wine regions. I have a preference for cool-climate wines with finesse, balance, vibrant acidity and a personality of their own, and on all these counts, the Jura delivers, time and time again. Hérisson waterfalls – L’ Eventail. Jura, July 2016. 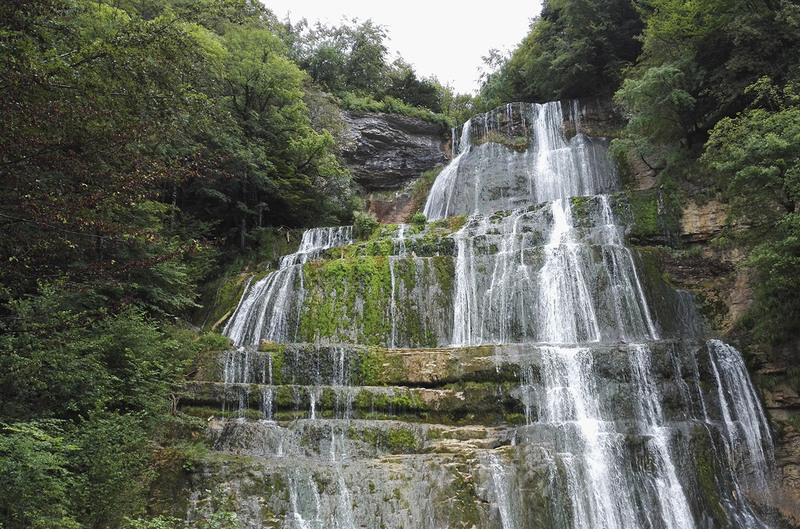 The Jura is a rural region in the East of France, situated between Burgundy and Switzerland and named after the beautiful, lush, green Jura mountains. It’s got a turbulent history, politically as well as when it comes to wine growing, and for some reason it remains off the beaten tourist track, in spite of its wonderful scenery, great wines, scrumptious cheeses, picturesque villages, cultural & culinary events, thermal spas and lots of opportunities for hiking, mountain biking, camping or winter sports. 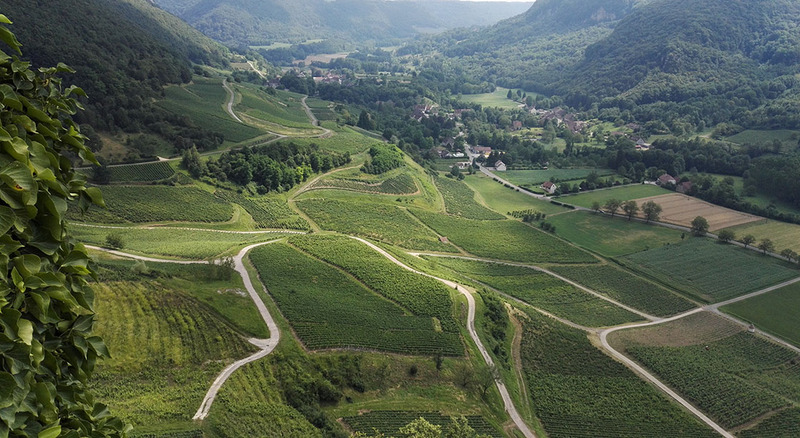 Each of the Jura appellations, grape varieties and wine styles is interesting in its own right, and you can read all about them in the excellent documentation provided by the Comité Interprofessionel des Vins du Jura. But allow me to point out a few of my personal favourites, starting with the Crémant du Jura. Very few regions in France offer such good-value sparkling wines. Hand harvested and made in the méthode traditionelle, like champagne, they are often produced from Chardonnay or Pinot Noir, although you can find a range of blends, including Trousseau, Poulsard, Pinot Gris and – sometimes – Savagnin Blanc. Crémant du Jura exists in white and rosé, from bone-dry to delicately sweet. The legal requirement is that the Crémant has to mature for at least 9 months on its lees, and another 3 before it’s allowed to be sold (as opposed to the 12 (15) months for a non-vintage Champagne), but you’ll have no trouble finding Crémants du Jura that spent 3 to 4 years in the cellar before dégorgement. Crémants du Jura are usually light, floral and fruity, showing citrus, hawthorn blossom, fresh breadcrumb and ripe orchard fruit. Most are meant to be served chilled (6 – 8° C), with the exception of the special cuvées, where a slightly higher temperature brings out more the complex aromas. Tasting at Domaine Berthet-Bondet. Château-Chalon, July 2016. When a Jura white wine is referred to as ‘floral’, it doesn’t necessarily mean it smells or tastes of flowers. ‘Les Blancs floraux’ is a way to refer to white wines made with the classic winemaking techniques that we know from most other wine regions, where barrels are topped up (‘ouillé’) when wine evaporates. Keeping them filled to the brim avoids excess contact with oxygen. Most ouillé wines in the Jura are made from Chardonnay, but you will also find ‘floral’ wines from Savagnin Blanc. They’re generally more subtle, elegant, mineral and restrained than the powerful ‘tradition’ whites, but these wines too have a generous, lightly exotic character that makes them uniquely Jura, with aromas and flavours of linden blossoms, hawthorn, honeysuckle, orchard fruit and pineapple over layers of butter and stony minerality. Don’t serve them too cold (recommended: 10 – 12°C), if you want to capture their full aromatic character. 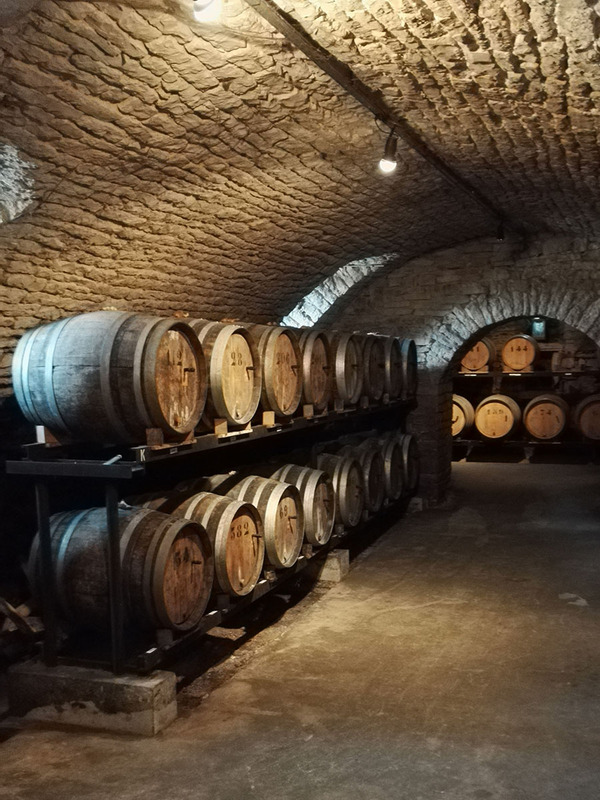 Cellar at Domaine Berthet-Bondet. Château-Chalon, July 2016. Wines in this style are often a blend of Chardonnay and Savagnin Blanc, or can be varietal Savagnin Blanc, the grape that might well be the Jura’s greatest pride. Don’t confuse it with Sauvignon Blanc, though, the two are not related. When wine matures in barrels, and because wood is a porous material, a part of the wine will inevitably evaporate. In most wine regions in the world, the barrels are topped up regularly to avoid too much oxygen that would affect the wine, but for some wine styles, the winemaker chooses not to fill up the barrel, to allow a veil of yeast to form on the wine’s surface, which will protect the wine and add a whole new world of aromas and flavours. These tradition or non-ouillé Jura whites have a nutty and savoury character, presenting aromas and flavours of walnuts, hazelnuts, dried figs, crushed apple, ginger and curry spices. On the palate they are generous and round, yet with a refreshing lift of acidity and a characteristic, recognisable salinity, not unlike fino sherry. They pair beautifully with aged Comté cheeses, mushrooms, quiches and creamy poultry dishes, and one of the most unexpected food & wine discoveries for me was a Jura tradition white paired with butter-baked lobster. Vin jaune 2000 – Château d’Arlay. July 2016. 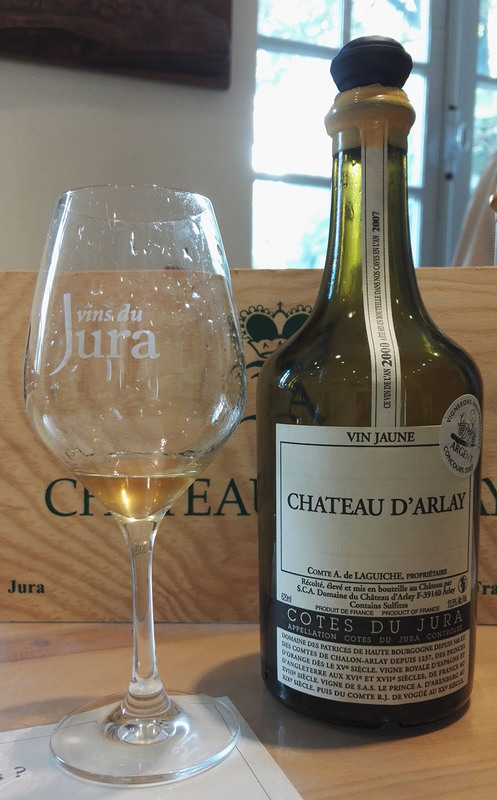 Without a doubt the most unique and peculiar wines in the Jura are the vin jaunes or ‘yellow wines’, named after their precious golden colour. Vin jaune is produced exclusively from Savagnin Blanc grapes, and in all 4 ‘regional’ denominations of the Jura: Arbois, Château-Chalon, Côtes du Jura and l’Etoile. However, in Château-Chalon, where it originated, only vin jaune can be produced under the AOC. Vin jaunes are incredibly long lived, possibly for centuries. Even an open bottle can keep for months, or even years – if you can resist the temptation that long. In the words of one of my professors in Suze-la-Rousse: “vin jaune is a wine that has been through so much, nothing scares it any more”. And he had a point: it spends no less than 6 years and 3 months in non-topped-up barrels, under an active veil of yeast that imparts the characteristic aromas and flavours. After this process, from every litre of wine, there is approximately 62 cl. left – a fact that’s symbolised in the traditional 62 cl. clavelin bottle in which vin jaune is sold. The remaining – evaporated – 38 cl. is called ‘la part des anges’, the angels’ share. Vin jaune shares the aroma and flavour characteristics of tradition whites, but even more intensely so. Walnuts, hazelnuts, cashews and almonds, interspersed with dried fruit, oxidised apple, ginger, mushrooms, sotolon (curry, fenugreek), heady floral notes and the delicate, uplifting saltiness of a firm sea breeze. These are meditation wines, immensely complex, full-bodied and balanced, with lively acidity, roundness, a delicate saline touch and an endless, evolving finish. Great to savour on their own or with aged Comté cheese, chicken in creamy vin jaune sauce, mushrooms, cheese pastry or lightly-spiced Asian dishes. But let my personal preference for dry white wines not lead you to believe that this is all the Jura has to offer. 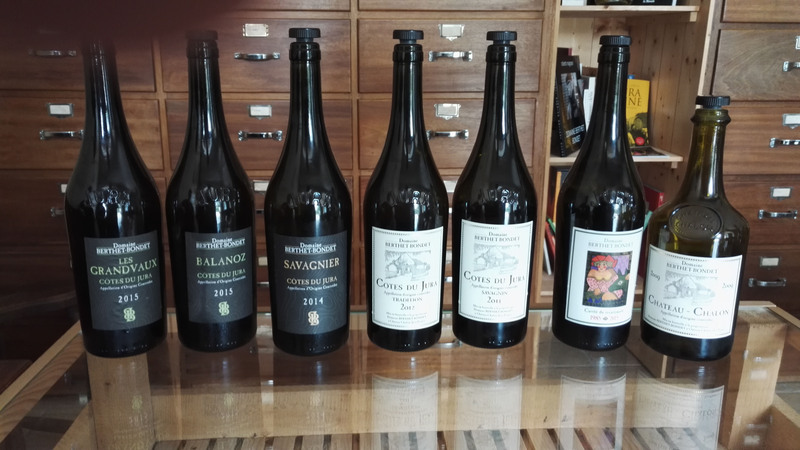 Their light red wines of local stars Trousseau and Poulsard/Ploussard can be a bit rustic in aroma profile, but they are worth exploring – and remarkably food friendly! And I have not even begun to describe the merits of the sweet, lush vin de paille, the heady liqueur wine macvin and the spirited marc. But it is getting late now, dear reader, and these are tales to be told another time. Be well! 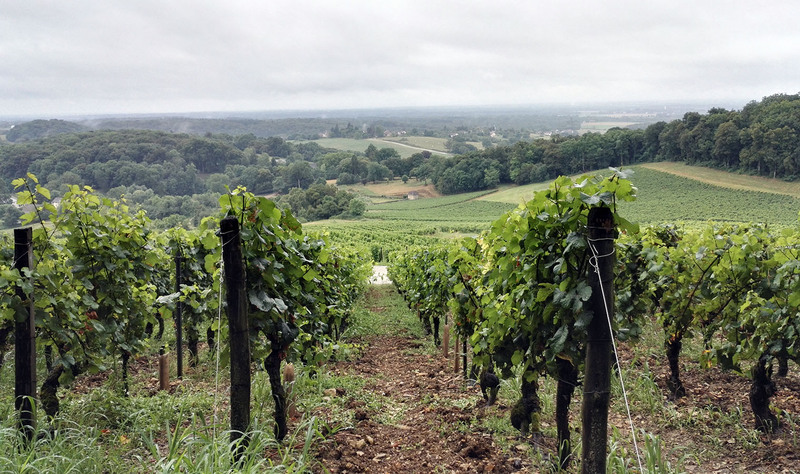 Jura – views over the Château-Chalon vineyards. July 2016. Thank you for this great post, Kristel! Always good to learn a bit more about this wonderful region.